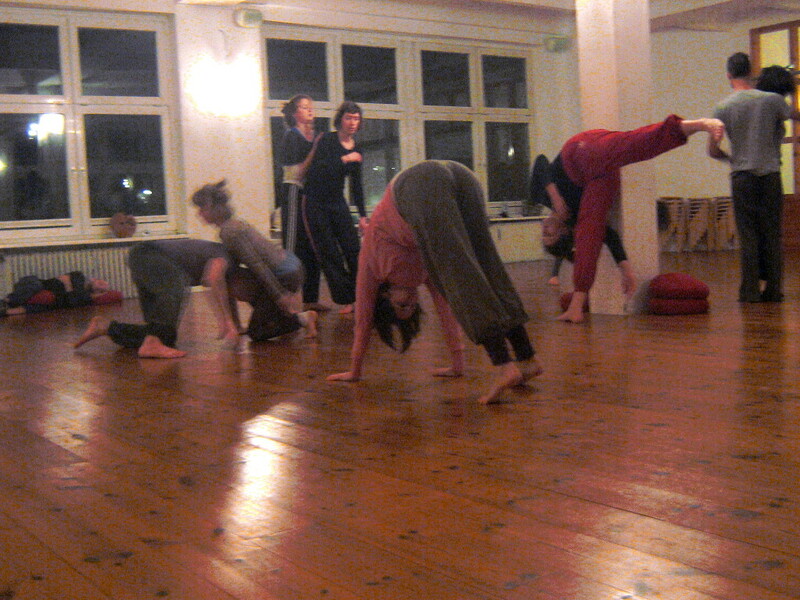 This is the first day of a five day winter intensive with Joerg Hassmann. 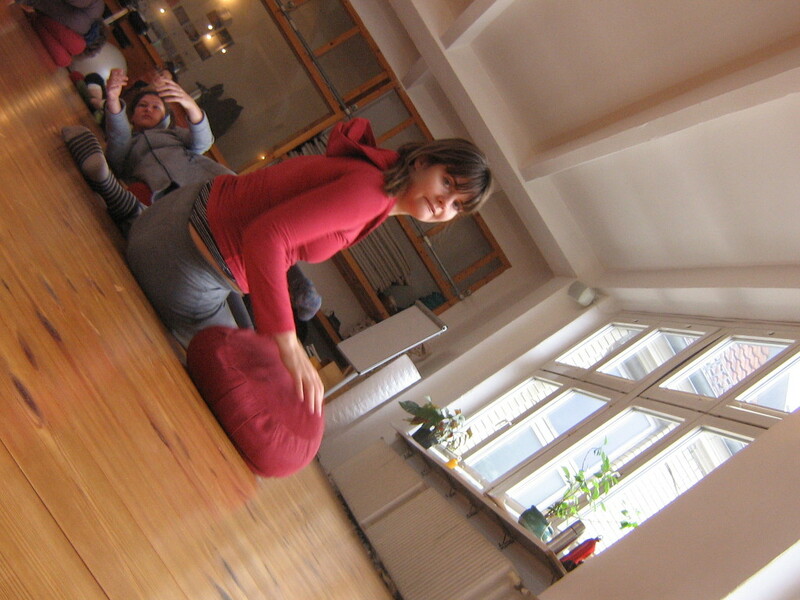 We sit on the floor in a circle – about 20 people – and our teacher Joerg Hassmann introduces the course. 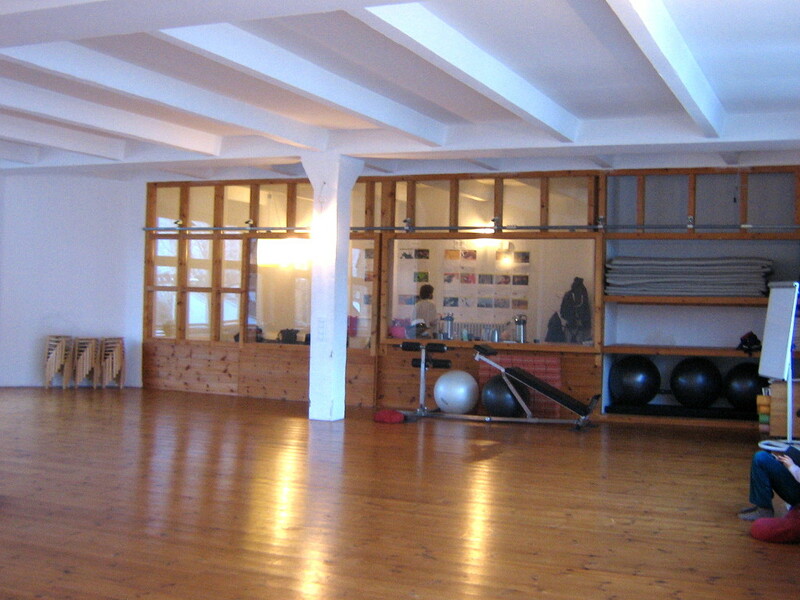 It’s the first day of a five day intensive training at the Somatische Akademie in Berlin called Grounding and Fragile Balances. 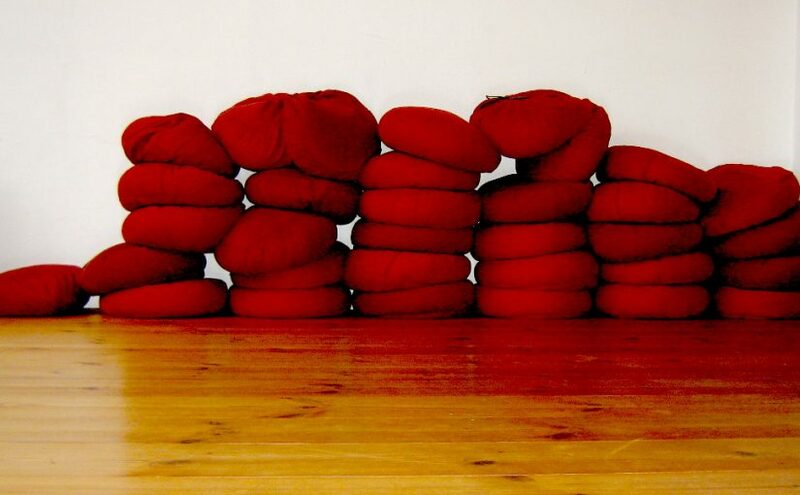 We’ve each been given a cushion by Jeorg with which we play and explore how our weight can roll onto it or rest on it. It’s firm and molds to our body while supporting us. We put our pelvis on the cushion and explore balances on it. 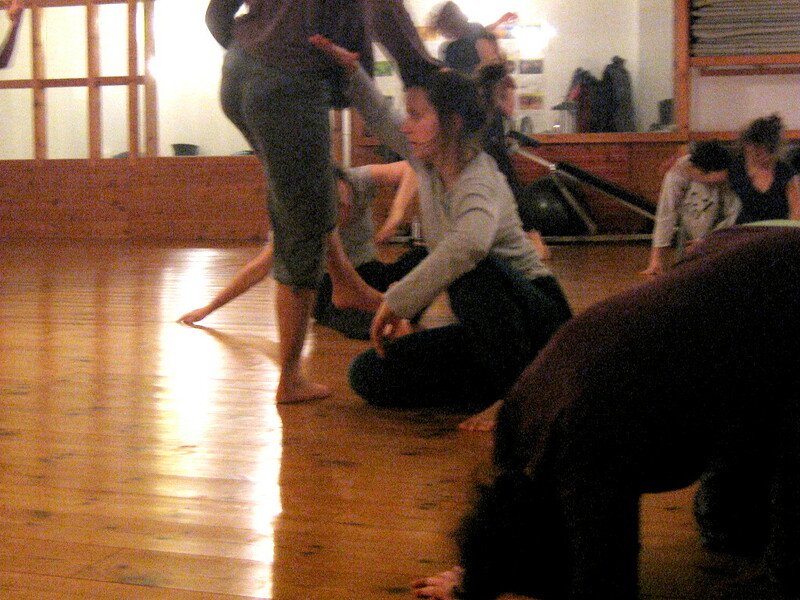 Practice opening and closing (our knees to elbows, rolling from back to side). Joerg adds “This is perhaps your first movement”. Lay on your back and put the cushion on your belly. What movements are possible; how does it feel; what displacements occur and how does the cushion fall. I also put the cushion on my chest and it feels so much heavier. Odd! Joerg suggests our movements lead to incidental contact with others until we dance with them – mostly in duets. I dance with another person and a cushion is also part of it. We finish dancing and assemble into groups of three, introducing ourselves to each other. Looking around the room, we’ve been asked to name other people who we recognise. Then we gather in a circle all together, and there’s a names round. We find a partner and sit on the floor: one of us sits upright and the other lays on their side with their belly touching the back of the seated dancer, and the underarm and thigh wrapped around the sides of their partner. The under-dancer (the one laying on their side behind the other) is leading the moment and they gently roll onto their back allowing the weight of the other dancer to rise onto their belly. As the overdancer moves back, maintaining the contact of their partner then they turn their upper body (twisting), weight is exchanged and the under-dancer guides the over-dancer. We swap roles and repeat the exercise which leads to dancing in contact duets, and trios too. After lunch. We walk around in the space. Raise your eyes says Jeorg, creating awareness of the space all around. We work in trios: standing, walking, moving on our feet. We use our arms to come into contact and slide, roll and move in-and-out of contact with one and another. Open hands, no weight giving or taking. Incidental contact. There are constellations of people in groups of three or four with movement of people between them. We feedback our experience of the dancing to the group, and Joerg says this way of dancing – without weight giving and mostly walked – is dance that is less technically demanding way of giving weight. He introduces the next exercise. He uses the phrase ‘empty hands’ to describe giving touch with the hands to a partner but without intention. He reflects on his own journey with intimacy and how he overcame it, his background is as a gymnast. In this exercise we are concentrating on our centre – just below our belly button. We work in pairs: one partner lies on their side on the floor and rests their head on their hands – they are leading. Initially, the other partner sits or kneels and simply looks, using their eyes to follow their partner lying on the floor. There is articulation of the centre in the lying person, and their shoulders and hips follow. You can ‘point’ with your belly button/centre, and roll a little on your side too. The sitting partner brings their hands into contact – one on the hip and the other on the shoulder. Those giving touch listen with their hands and follow the movements with their hands. There is exploration of small movements in the spine of the receiver: there is pivoting on the hip bone/ pelvis and in the shoulder as the receiving partner follows the movement without hast or vigour. 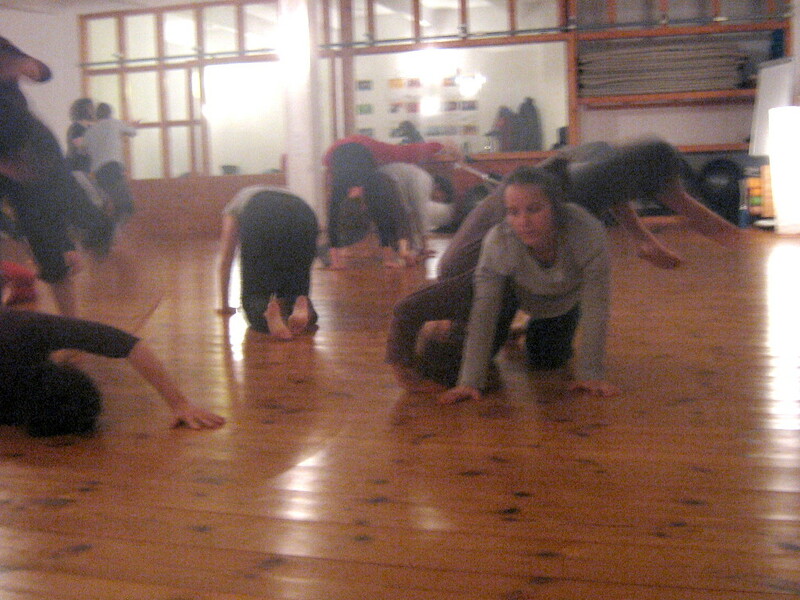 Gradually, the movement in the centre and body can increase with the leader moving off the ground. The exercise continues but there is no weight giving. We then proceed to jam and dance more freely. The two dancers then swap roles and the leading person becomes the following one, and the following one is the leading one who starts the exercise reclining on the floor. The exercise proceeds to dancing and before, and in the second iteration of the dance then the dancing leads to the giving and sharing of weight although it feels more like the sharing of surface and movement over surfaces in my and my partners dance. When we swap dancers then I partner with Joerg, the teacher. It is our first proper dance of the first day, and there is a sense of excitement and discovery. As you might expect, Joerg is a skillful and practiced dancer, and we have a very enjoyable dance together. Afterwards, we discuss our dancing. I’ve found that as dancing becomes more euphoric and rushed then it can be difficult to move beyond learned movements; and there are also moments when it almost becomes ‘combative’ with too much energy. ‘Slow down’ says Joerg, and I reflect on other strategies too: ‘joke movements’ outside of the contact vocabulary; bringing awareness to a specific body part and articulating/dancing it e.g. a shoulder; bringing awareness to a specific sense. For example the sense of smell and using it to breakout of being ‘frozen’ in the moment. Everyday, there is a dance session – a jam. The winter darkness comes in the late afternoon. There is darkness through the studio windows and an effuse yellow lighting within. We jam until the end of the first day.